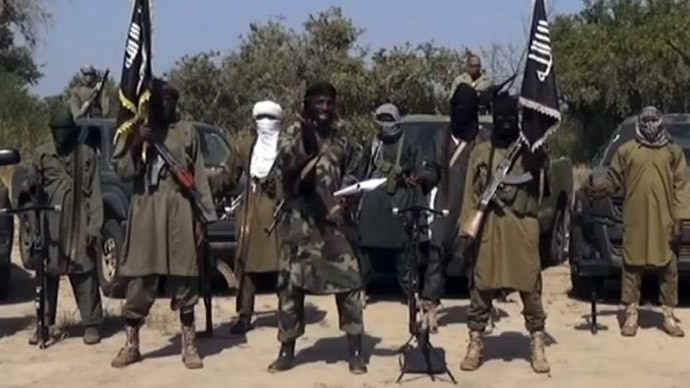 At least 68 people have been killed by Boko Haram militants in north-eastern Nigeria close to Maiduguri, the capital of the Borno state, witnesses said. Many kids are reported to be among those killed, as a village was stormed and then put on fire. The gunmen attacked the village Njaba in Dambua area, about 100 km from Maiduguri, early on Tuesday at the time of the morning prayer. The incident was reported much later due to the remoteness of the location. Witnesses, who managed to escape from the village, said the militants targeted mainly men. “There was pandemonium everywhere,” Fatima Abakar said told The Sahara Reporters. “I ran into the bush. Since then I [have] never seen my husband and three children. [I] came back to our village in the afternoon, dead bodies was scattered everywhere."" In the course of the massacre the gunmen blew up houses with petrol bombs, setting the village ablaze before leaving. “They burnt many houses. Many people fled the villages into the bush," Kurri Bulama, local resident, said. The survivors who returned to the village after the attack said the dead bodies were lying everywhere in the area unattended. “I participated in the counting of dead bodies. Sixty-eight people were killed,” Muminu Haruna, a witness, told AFP after escaping the attack on Tuesday in Njaba. The witnesses said there were no military present in the village since Monday. Boko Haram is trying to create an Islamic state in the northeast of Nigeria and has killed thousands and kidnapped hundreds in the process. It has also threatened Nigeria’s neighbors: Chad, Cameroon and Niger. Some 1.6 million Nigerians have been displaced, and thousands have been killed as a result of the militants’ deadly attacks. In January the group massacred more than 2,000 people in the northeastern town of Baga. The area of Maiduguri is seen as a key strategic goal for Boko Haram, which wants to carve out an Islamist state in northern Nigeria. The terrorist organization last tried to take the city in December 2013. They managed to seize a local air force base which led to clashes with regular troops.